Calming Glitter Jars are a game changer for children and even adults! Occupational therapists have told me that they love using my calm down glitter jars to help students and children self-regulate and just melt away the troubles that are causing big emotions. I’ve used calm down bottles both in the classroom as a preschool teacher and also at home with my own children. They are hands-down some of my favorite tools to help keep a calm and relaxed atmosphere as well as to prevent meltdowns. But we also love to use them in places like dramatic play, house area, or quiet areas. If you are looking for tips on how to choose the right bottle and to find the perfect ingredients, here is my guide on how to make the perfect sensory bottle. I do recommend using plastic containers if there is a risk of it falling on tile or any other really hard surface. Some people find glass to be a great fit, but only you can make that determination. Remember to hot glue or super glue it at the end so that you don’t end up with glitter all over. Lots of people ask what my favorite bottles are, and these VOSS bottles look absolutely beautiful. But you can really use any bottle. These bottles go by many names: calm down jars, calm down bottle, glitter jars, glitter mason jars, mindfulness jars, and more. But essentially they all provide the sensory input that some children just can’t get enough of. Now here are some great calm down bottle recipes to help melt the worries away or just for fun too! We’d love to hear which ones you’ve tried and loved! 6 Ways to Make a Calm Down Jar – Glitter jars can be made of lots of different ingredients, and this awesome tutorial breaks it all down for you to figure out which calm down bottle is the best for you. There is even a guide on how difficult they are to make and how long the glitter lasts! 3 Ingredient Galaxy Bottle – If you are looking for a sparkly sensory bottle, this 3 ingredient sensory bottle is it! The stars are so fun and look like shooting stars falling in the bottle. Glowing Bedtime Bottle – This glitter bottle is perfect for studying stars or for a little extra comfort at bedtime. The glowing stars make it extra fun! Floating Hearts Sensory Bottle – When making glitter bottles, you can add other fun objects too. These hearts make it even more inviting. Heart Glitter Jars – These are absolutely mesmerizing! 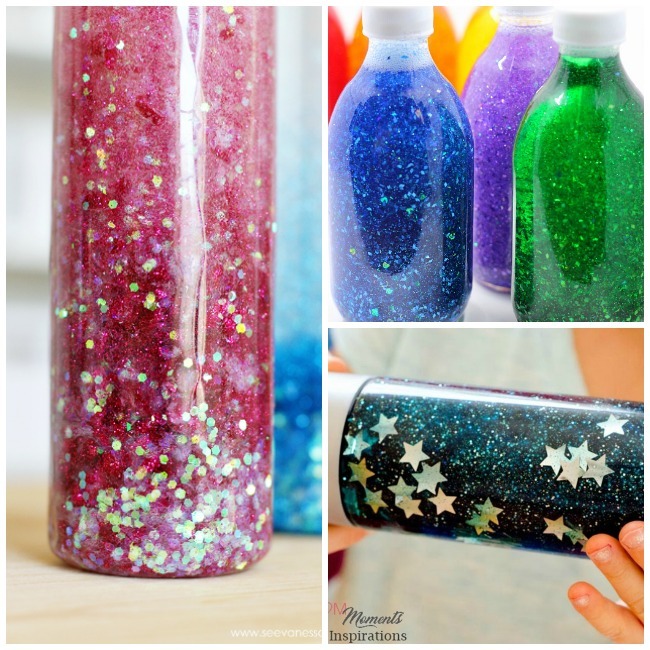 are the perfect example of a fun glitter bottle that you can make with kids! Galaxy Jar – This calming jar can have a calming effect but also can be a perfect addition to teaching about the solar system! Mermaid Tail Jar (pictured) – This glitter bottle is fabulous for a timer or to help calm an overwhelmed mermaid. Falling Star Glitter Jar – A mason jar calm down bottle that’s absolutely beautiful. The falling stars in this calming bottle can be a perfect way to help children fall asleep in a soothing way. Silver & Gold Glitter Jars (pictured) – Get all of the supplies for these calm down bottles at the dollar store. These glitter water bottles are not only inexpensive but have special benefits for children with anxiety and work perfectly for sensory play! Glitter Sensory Bottles (pictured) – These glitter bottles are absolutely beautiful to watch and a sanity saver for this mom who has a toddler that stopped napping (I feel ya, mama!). See how to make it in the video below. Plastic Glitter Bottle – Whether you are using a glitter water bottle for a sensory activity or for a tranquil assistant during nap time, this glitter bottle is perfect for kids of any age. Patriotic Glitter Bottle -If you’re like us, we like to switch up our activities for holidays and special events. This calm down glitter bottle is perfect for celebrating anything patriotic! Snowflake Glitter Jar – What’s almost as relaxing as watching snow fall? Watching this calming glitter jar comes pretty close, especially since you can watch it regardless of the weather. Light Saber Bottle – Star Wars and glow in the dark go hand in hand in this glitter water bottle. This is a simple way to help little Star Wars fans calm down while syncing with their interests. 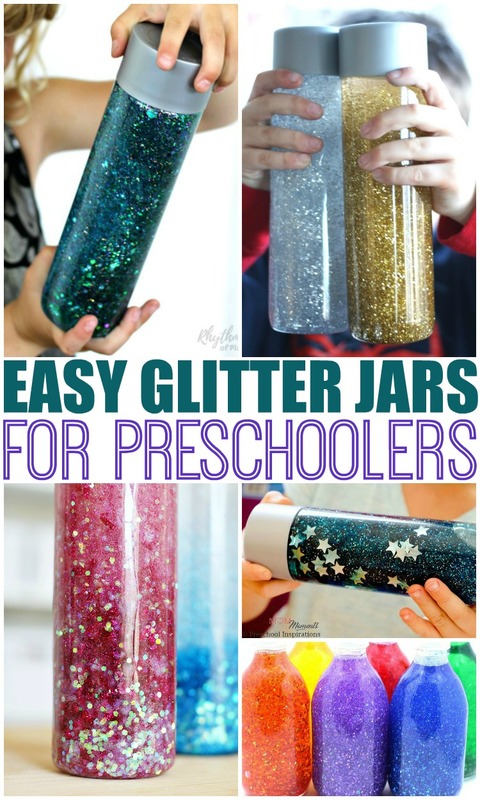 Rainbow Glitter Jars (pictured) – These glitter bottles have enough sparkle, shine, and color to entertain and calm an entire preschool class! Frozen Inspired Sensory Bottle – This is definitely one of our favorite calm down bottles, and you can easily see why in the calm down bottle video below! Rainbow Galaxy Bottle– Rainbows are a beautiful, wonder of the world. Kids get so excited when they see one in the sky. The is the perfect, colorful glitter bottle for sensory play and a great weather themed activity. Anti Gravity Bottle – This is not your average glitter water bottle. The glitter will spread when shaken and settle when the bottle is set in place. This is fantastic for not only use as a calming or sensory activity but great for a lesson in gravity. Magic Bottles – Not only do these calming bottles sound magical, but they look magical too! Sparkle Bottles – Although calming jars are often thought of as an emotional regulation tool for children, these sparkle bottles were made for long car trips as a boredom buster. Brilliant! Blizzard In A Bottle – This is much like the other calming bottles I have shared, but these are used on a discovery table with a magnifying glass. Kids will love discovering what can be seen with the naked eye and what can be seen with a magnifying glass. Calming Glitter Bottle – All of these tutorials have excellent instructions and give great benefits for using calming jars. This wonderful tutorial also shows what not to do when making glitter jars. These tips might be super helpful for you! Whether it’s calmness, mindfulness, or relaxation your child needs, these glitter bottles work wonders! You are never too old or too young to use one either! Hello Katie. Thanks for sharing all this beautiful and nice ideas with us. It’s really amazing. I am a pre school teacher. So all your craft ideas help me to apply on my tiny tots. Stay blessed. Thank you for such a kind note! It means so much to me, Shuvra! Thank you for all you do for young children and spreading positivity.